Symbiotic relationships, where organisms of different species work together for mutual gain, have been studied extensively in numerous biological systems, but modern genomic techniques are revolutionising our understanding of how these interactions work at the molecular level. A recent paper by John McCutcheon and Carol von Dohlen has reported an interesting case of a ‘three-way symbiosis’ between the mealybug (Planococcus citri) – a significant pest of plants – and two species of bacteria. This interaction shows a high level of metabolic complementarity: the genes for several amino acid biosynthetic pathways that are essential to the mealybug are spread across the genomes of the three different species. This makes the mealybug completely dependent on its bacterial symbionts. The mealybug contains specialised cells called bacteriocytes. Within the cytoplasm of these bacteriocytes lives the first symbiont, a beta-proteobacterium with the proposed name Candidatus Tremblaya princeps. Within the cytoplasm of these bacteria lives the second symbiont, a gamma-proteobacterium with the proposed name Candidatus Moranella endobia. 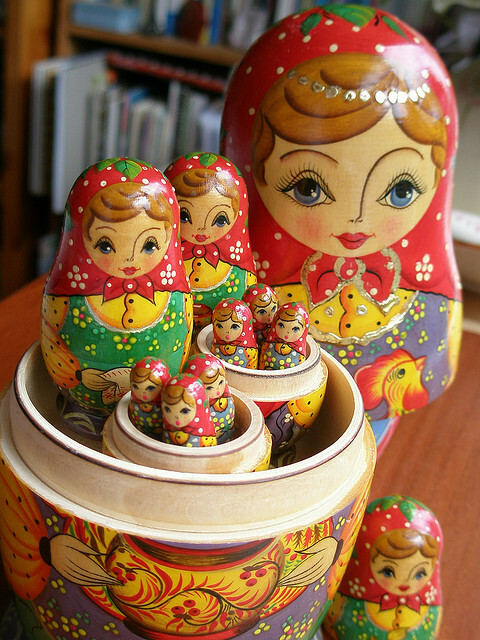 Think of them as Russian dolls. The researchers sequenced the genomes of the symbionts to reveal the secrets of this interdependency. Tremblaya has the smallest reported bacterial genome, encoding only 121 proteins (in comparison, the E. coli K-12 genome encodes around 4300 proteins). It is common for symbionts to exhibit reduced genomes when compared to free-living organisms; however, this level of reduction is remarkable. Interestingly, Tremblaya retains partial pathways for amino acid biosynthesis, yet none of these are complete. The remaining genes are supplied by Moranella and, together, the two bacterial species produce essential amino acids for the mealybug. The nutritional role that symbionts play in the formation of amino acids for sap-feeding insects is reasonably well established. In this case, given the lack of classic infective strategies in either of the bacterial species, it seems the host is largely in control of the organisation of the symbiosis and supplying the required nutrients. This work highlights some of the amazing biology that is still out there waiting to be discovered and reminds us that we are only scratching the surface of the biology of inter-species interactions. Paul A Hoskisson is a lecturer in microbiology at the University of Strathclyde. His research focus is on antibiotic-producing actinomycetes and emerging actinomycete pathogens.